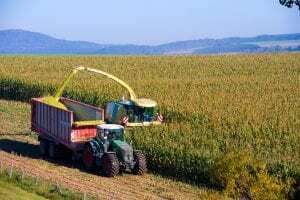 The October World Ag Supply and Demand (WASDE) report predicts corn and soybean yields will both be lower than previously expected. Corn production is forecast at 14.78 billion bushels, down 49 million bushels due to a reduced yield forecast. Corn supplies going into harvest are forecast to be a record-high number, exports were raised by 75 million bushels, and USDA also forecast reduced feed and residual use. The season-average corn price received by producers is unchanged at $3.50 per bushel. Soybean production is forecast at 4.69 billion bushels, down 3.5 million as higher yields will be offset by lower harvested area. The season-average soybean price is predicted to range from $7.35 to $9.85 per bushel, unchanged from the previous month. The wheat forecast predicts larger supplies, reduced domestic use, unchanged exports, and higher ending stocks. The season-average farm price range is unchanged at the midpoint of $5.10 per bushel and the range is narrowed to $4.80 to $5.40.